Planet of the Apes began its life as a mainstream hit. When producer Arthur P. Jacobs brought his version of Pierre Boulle's novel to the screen, he had no idea that it was going to be anything more than a moderately-budgeted, one-off science fiction feature. The cast was headlined by a single big name - Charlton Heston - but that was no guarantee of success. Heston was a marketable commodity at the time, but he had participated in his share of flops. The 1968 movie opened with a short prologue inside a spaceship. Col. George Taylor (Heston), one of four astronauts on board, gives a mournful monologue before joining his fellows in deep sleep. Approximately six months later, their ship crash-lands on an unknown planet. The survivors - Taylor, Landon (Robert Gunner), and Dodge (Jeff Burton) - emerge from the vessel to explore their new world, searching for the basics of survival, food and water. Soon, they discover that their new home is inhabited. There are other humans, but they are mute, and they are treated like cattle by the dominant species. On this planet, evolution has favored the apes, who have developed into the walking, talking, thinking rulers of a society where tolerance is minimal, and superstition is valued over science. The movie was a hit and created a firestorm of buzz. As more films were quickly planned, toy makers raced to stock the shelves. Mego won the race for the rights for action figures, and well, their popularity is legendary in the toy circles. Any MBA executive would agree that movie merchandising rights can create millions of dollars in income every year. The best executive MBA programs even have specialized degrees in merchandising for business administration majors. Almost every major toy maker in the 1970s dabbled in the Planet of the Apes and the more popular items are discussed herein. Tommy-Burst Rifle w/ Mask Multiple Toymakers Mini-Playsets Did You Know? 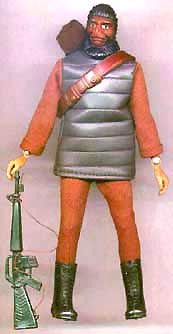 Mego obtained rights to an 8" action figure line in 1973. 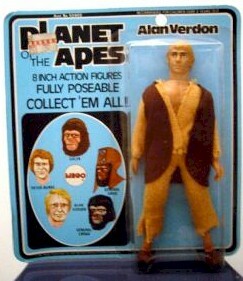 They launched five action figures that year - Cornelius, Zira, Dr. Zaius, Soldier Ape and the Astronaut. These figures were sold on metal rivet bodies (known as Type 1 to Mego collectors). They were sold in limited numbers in window boxes initially and the exclusively blister carded from 1974 on. In 1975, they added five more figures - Urko, Ursus, Verdon, Burke and Galen. They also expanded the playset line. Oh yes, the classic Cornelius. A great figure, probably the most commonly found. 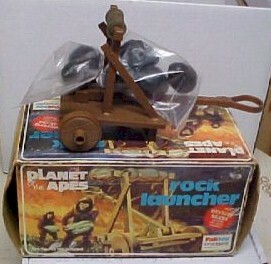 He was sold in the first series on a Type 1 metal rivet ape body. 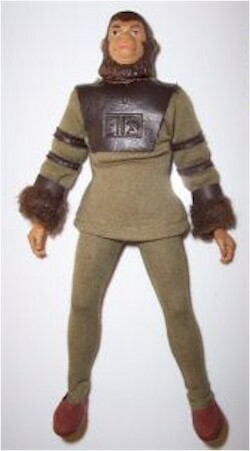 Cornelius came fitted with a stylish olive green tunic and pants and brown standard Mego moccasins. Two versions exist, a green cloth version and a brown cloth version. Honestly, both are pretty common although the green is the "standard" version. Ah, yes the good doctor. Zira came fitted with a stylish olive blouse and skirt and some really sad brown cowboy boots (same as Dynah-Mite). The blouse has maroon inner sleeves attached to the outer sleeves. 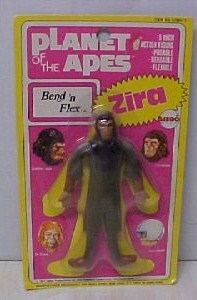 Also of note: Zira is the only standard Mego utilizing "space-age" Velcro. It leads one to wonder why they did not use it on any of the later figures, but it is possible that at the time it was still new and fairly expensive and also Zira would be the only figure with a FRONT snap, so perhaps they used Velcro to avoid those unsightly sew strings from a snap. 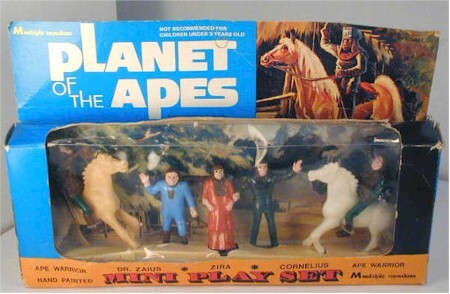 Dr. Zaius was another popular figure in this series. His head sculpt is excellent and his outfit is very solid. Well, for an ape. Dr. Zaius did not have variants other than in the boots he was sold with. Some versions were sold with Black Superhero boots (seen here) and some were sold with very cool black "hiero" boots which have marking like hieroglyphics on the sides. A definite hit, this figure is probably the second most common to Cornelius. His gloves are pathetic, but they beat brown plastic over mits like Robin has, which I am sure they considered. An army of Soldiers is a must for the true Ape collector, they just look great in mass. 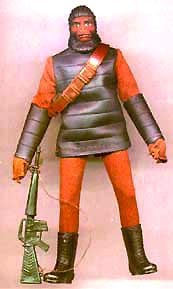 Each Soldier Ape came complete with plastic bandolier, machine gun with string, black lace-up boots, brown cloth (with leather torso) tunic and pants, and the charming leather gloves. Mego decided not to pay the rediculous royalties Heston wanted, so instead they made a plain figure and called him The Astronaut. Sporting some super groovy sideburns, the Astronaut is ready to boogie. 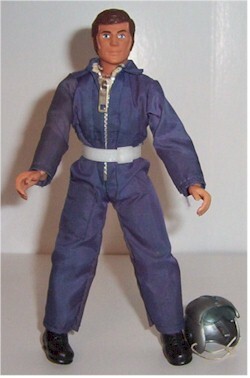 He comes with a cool blue flight suit, helmet with working visor, a white plastic belt, and black low-top boots. He has also been found carded with a white elastic belt and white boots as well. 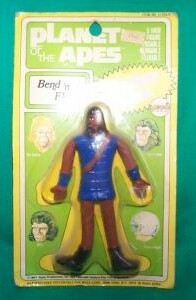 Also known as "Urko" or "Helmet Head" in the Ape world, Mego really set out to confuse kids by changing the names on these figures throughout production. Mego packaged Ursus and Urko (the other General) under both names, but I will stick with the more commonly accepted naming convention. Ursus is a really sharp figure. Sporting a super-cool molded on helmet, he is an intimidating figure for the others to stay clear of. 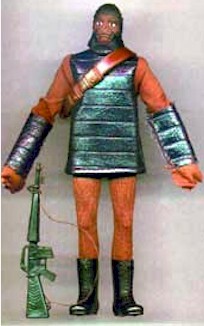 Equipped with general bandolier (w/ knife), machine gun, general ape boots and a unique purple cloth top with mustard colored tunic and cuffs. He is also found with a darker brownish colored leather part of his tunic, less commonly. Also known as "Ursus" or "Black Face" in Ape land. Urko is a really cool figure and is my favorite in this line for some reason, followed closely by Ursus. 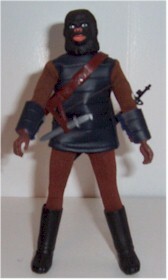 Urko comes equipped with a unique tunic which is something like a Soldier Ape Tunic with leather cuffs. Also wears a General Bandolier (w/ knife), machine gun and general boots. 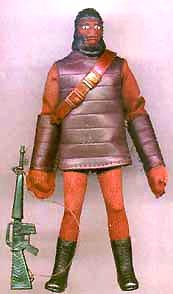 Of note it should be said that this figure was originally sold in Soldier Ape Attire (tunic and gloves) but did have the proper general bandolier. Thus all variations of the Soldier Ape can exist in theory for Urko though I have only confirmed the Brown and Silver variations myself. Mego actually reproduced them very well, they have great head sculpts and nice "slave" attire. Verdon (blonde hair) came complete with torn light yellow pants (same as Burke), torn light yellow top, brown cloth vest and standard brown Mego moccasins. 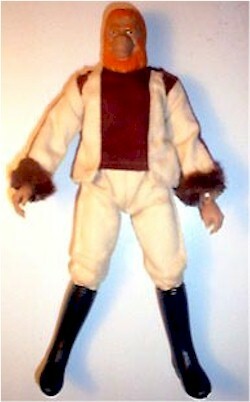 Burke (brown hair) comes complete with torn light yellow pants, burlap type vest, brown shirt and standard brown Mego moccasins. Hmm, looks familiar doesnt he? Yep, your eyes are not fooling you, Mego cut the corners here and he is identical to Cornelius. Well, ok, they painted his ears green and the leather portion of his tunic is purplish in tint usually but otherwise that is the only difference between this figure and the Cornelius figure. 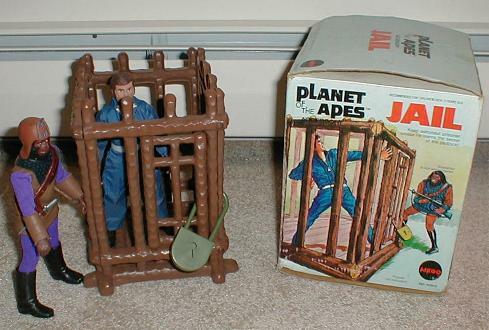 However, he was mostly released on Type 2 plastic joint ape bodies. Galen has been found with same two outfit variations as Cornelius. 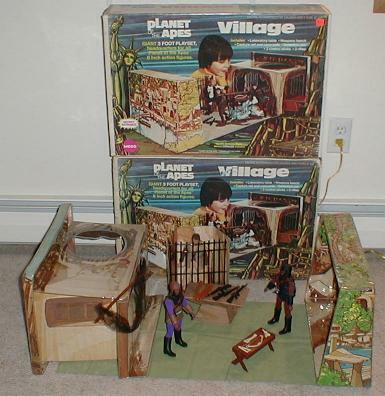 From 1973 to 1975, Mego released some great playsets for their Planet of the Apes line of action figures. This line has by far Mego's largest in terms of number of playsets and accessory sets and they were all quite popular. This is a great set. Came with 10 hollow plastic boulders that launch nicely! Palitoy released the set as the Rock Launcher in the U.K.
General Ursus using the advanced potty training device. "Now, this time go number two or else!" "Hey, dont look at me! I can't help it that the ape on the box was never available!" Suddenly the Astronaut realizes he does not need a lockpick to escape since his entire hand can fit in the keyhole. This set is huge and awesome on display. Mego whipped out one of the best playsets to date with this bad boy. 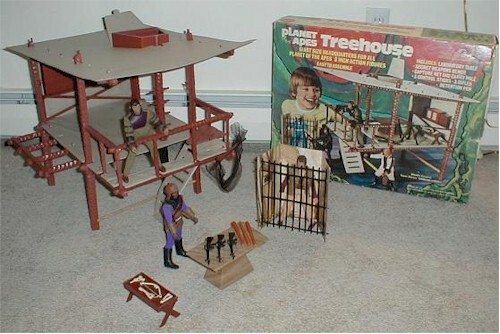 Ok, so EVERY piece of this playset is from earlier playsets (the Treehouse came from an Action Jackson playset). The four white pieces on the table combine to make a crossbow. Nifty, but, um, I will take an M-16 thank you. 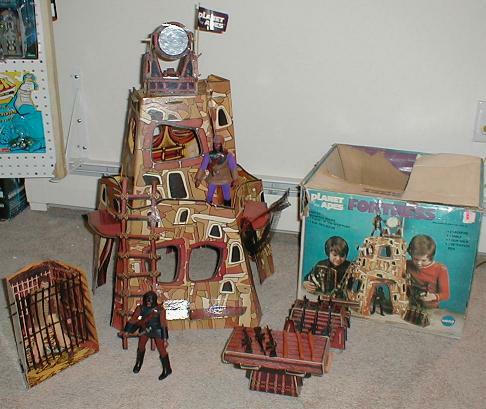 Every part of this playset can also be found in other Mego playsets. Oh wait, no, the paper graphics under the vinyl are different! The case also serves as the Batcave and Action Jackson Lost Continent. By far the most common packaging for the Mego Planet of the Apes action figures are blister cards. 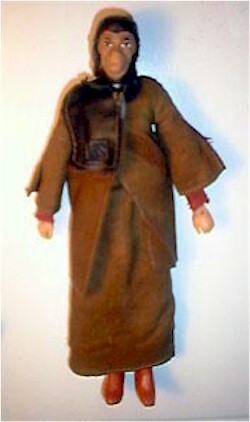 A limited number of figures were sold in window boxes, the same design that Mego used for several other action figure lines. 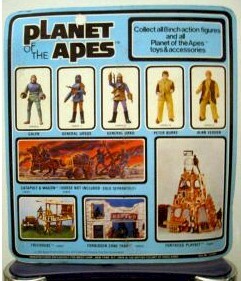 The truly great packaging was only available to those darn kids in the U.K. Palitoy (of course) bought the license to market Mego Planet of the Apes toys in the U.K. and the packaging for their figures was the best by far. Wow. Mego released six Bend 'N Flex figures in 1974. Included were Cornelius, Dr. Zaius, Zira, Soldier Ape, Astronaut and Galen. These are pretty easy to find today. 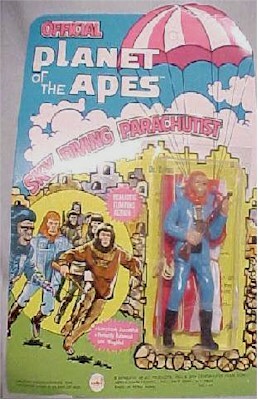 Ahi released parachutist toys for the Planet of the Apes line. Included were Zaius, Galen, Cornelius and the Soldier Ape. 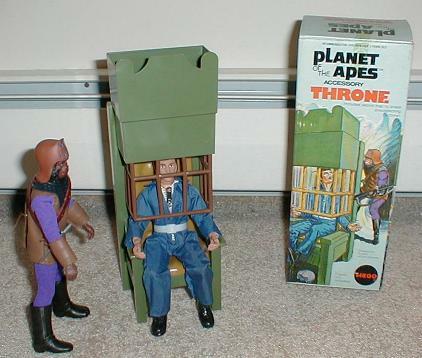 Mattel's limited dip into the Planet of the Apes toy realm came long after the main toy rights were grabbed up. However, they did produce a very hard to find Tommy-Burst rifle, bolt action sub-machine gun, AND an ape mask! "Fires bursts or single shots!" "Real machine gun sound, no caps or batteries!!" Although Mego had snatched up the main action figure and toy rights, they had no interest in miniatures, so Multiple Toymakers released a line of small figures and playsets. They are all very poorly painted, have very little detail and look like they paid kindergarten children lollipops to paint them. They also sold them mail order through Sears from 1968 through 1970. 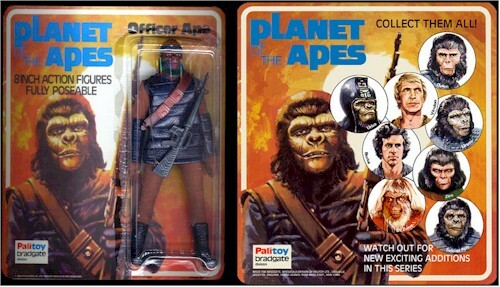 An interesting note is that the Astronauts Burke and Verdon from the Mego 8" action figure line are not made up, as many collectors believe, but are two wild and crazy guys on the run from the ape generals in the short-lived TV series, Planet of the Apes.